Necessity sometimes breeds invention and since Antonio Conte got a hiding against the gunners late October, the Italian reverted to 3-4-3, at Siena, Juventus and even with the Italian national team it was 3-5-2, but at Stamford Bridge he has modified things to accommodate his offensive players. 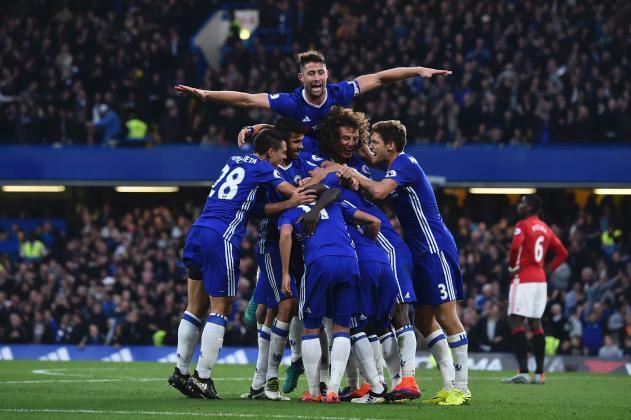 Since the Arsenal game, Chelsea have won four and conceded none. David Luiz remains a tickling time bomb, Gary Cahill still has his flaws and Ceasar Azpilicueta is not commanding aerially, but Conte has made them tough and disciplined. Victor Moses remains a lesson in not giving up (8.4 ratings from whoscored.com making him the second best ranked player behind Eden Hazard at St Mary’s) while Ngolo Kante has been massive alongside Nemanja Matic. Eden Hazard is undergoing a renaissance, one that has produced five goals (the Belgian managed only four last season). It didn’t matter what way it came, a win was important for Pep Guardiola against West Brom and they got to business quickly. After the game Pep Guardiola had to stress the importance of Aguero believing he is on the same level as Lionel Mess and Luis Suarez inside the box. He spent a lot of time in that zone at the Hawthorns. Its time City build another positive run and send another message to their critics. Jorge Sampaoli handed Diego Simeone his first ever defeat in the hands of Sevilla and in that process ensure that Sevilla remained 100% at the Ramon Sanchez Pizjuan. But they need to sort out their away problems, we’ll recall that they couldn’t win a game away from home all through last season. This season, they’ve gotten one already (at Leganes), but they need more if they wanted to be taken seriously, with 21 shots on target, and 62% of possession, there has to be more end product. It would also be interesting to see how Sampaoli adjusts to life without Samir Nasri who had to exit the game at Halftime. Meanwhile, Alaves matched Real Madrid despite losing 1-4, they had 45% of possession and even had the audacity to take the lead. Theo Hernandez was a menace at left wing back but in games like this, quality has to shine through and Cristiano Ronaldo’s quality came through, not an imposing performance but the hat-trick will go a long way to restore his confidence. Barcelona were not brilliant against Granada despite the visitors mustering only one shot on target to Barca’s 15. Samuel Umtiti was also imposing at the back, completing 91% of his passes. Atletico look rampaging since Diego Simeone started tweaking his tactics to afford his offensive players freedom. Against Malaga, they netted three in the first half (Carrasco and Gameiro double), although Sandro got one back before halftime. But Simeone brought on his defensive goons to shut things down and when Los Colchoneros shut things down, God help you. The Frenchman has netted 11 goals , the most any player has gotten in the top five leagues in Europe, FC Koln are third in the Bundesliga and have claimed scalps like Dortmund and Leverkuseen, looks like the tidy business they’ve done is bearing fruits that should get them at least a Europa league spot. Extending Peter Stoger’s contract, fending off interest in Jonas Hector and Timo Horn has gone a long way. Modeste lost a first half penalty but recovered to get a hat-trick against an out of sorts Hamburg and if you’re feeling lucky, backing FC Koln to win the title is at 999-1, who knows, Leicester City’s fairytale run might rub off on them. Just to chip in RBLeipzig are still unbeaten (until they meet Bayern though), good thing is they have enough time to build steam and more momentum till that big date on December 21.